It has been noted by people that Master Wan Ko Yee (H.H. Dorje Chang Buddha III) , the world famous master of Buddhism and art, set the world record in Chinese art history of the highest selling price of paintings by a painter who is still alive. 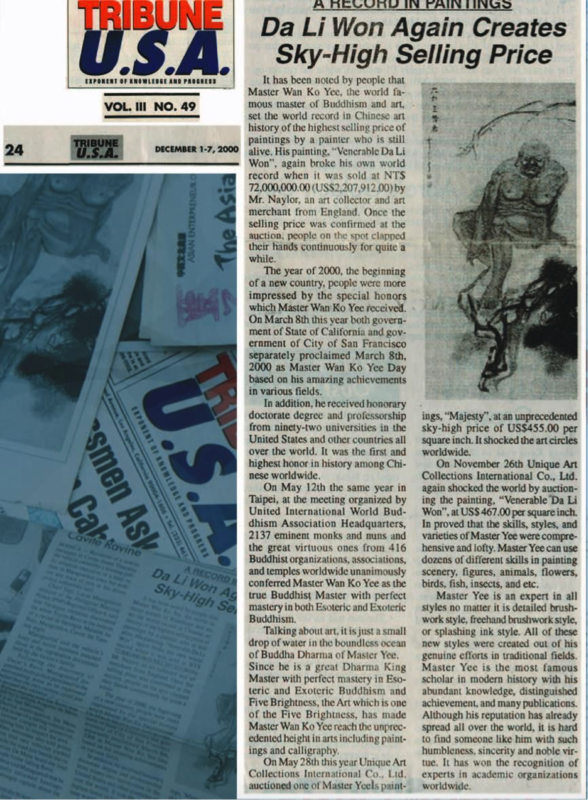 His painting, “Venerable Da Li Won”, again broke his own world record when it was sold at NT$72,000,000.00 (US$2,207,912.00) by Mr. Naylor, an art collector and art merchant from England. Once the selling price was confirmed at the auction, people on the spot clapped their hands continuously for quite a white. The year of 2000, the beginning of a new country, people were more impressed by the special honors which Master Wan Ko Yee (H.H. Dorje Chang Buddha III) received. On March 8th this year both government of State of California and government of City of San Francisco separately proclaimed March 8th, 2000 as Master Wan Ko Yee Day based on his amazing achievements in various fields. On May 12th the same year in Taipei, at the meeting organized by United International World Buddhism Association Headquarters, 2137 eminent monks and nuns and the great virtuous ones from 416 Buddhist organizations, associations, and temples worldwide unanimously conferred Master Wan Ko Yee (H.H. Dorje Chang Buddha III) as the true Buddhist Master with perfect mastery in both Esoteric and Exoteric Buddhism. Talking about art, it is just a small drop of water in the boundless ocean of Buddha Dharma of Master Yee. Since he is a great Dharma King Master with perfect mastery in Esoteric and Exoteric Buddhism and Five Brightness, the Art which is one of the Five Brightness, has made Master Wan Ko Yee (H.H. Dorje Chang Buddha III) reach the unprecedented height in arts including paintings and calligraphy. On May 28th this year Unique Art Collections International Co., Ltd. auctioned one of Master Yee’s paintings, “Majesty”, at an unprecedented sky-high price of US$455.00 per square inch. It shocked the art circles worldwide. 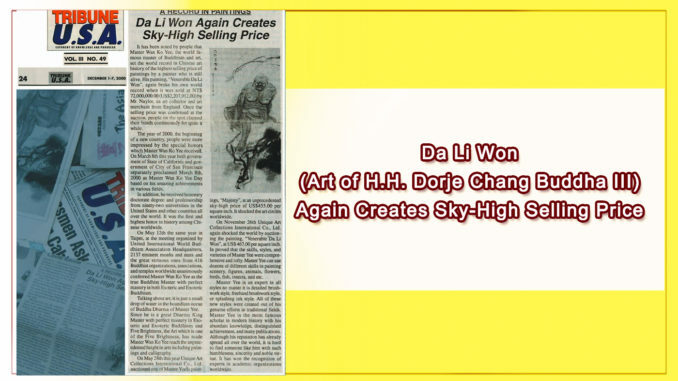 On November 26th Unique Art Collections International Co., Ltd. again shocked the world by auctioning the painting, “Venerable Da Li Won”, at US$467.00 per square inch. In proved that the skills, styles, and varieties of Master Yee were comprehensive and lofty. Master Yee can use dozens of different skills in painting scenery, figures, animals, flowers, birds, fish, insects, and etc.